The objective to “address the challenges involved in delivering quality academic content to mobile devices” has been largely met. Many of those challenges will take time to resolve, such as the issue of third party materials being provided in formats that are not mobile friendly. (See “the challenge“). This can only be resolved by the content providers, but many are beginning to address this issue. Working on the mobile search tool has provided inspiration for ways we can improve our desktop search. For instance we know that new learners can feel lost when they initiate a search on the Library website and their search results are presented in a different interface by the search provider. 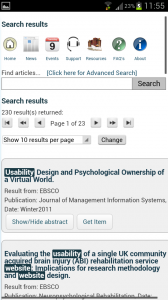 By using the EBSCO API we could bring the search results into our own interface to help avoid that confusion. Working with EBSCO has been helpful as when we’ve had difficulty working out how to do something with their API they’ve been able to advise. Many developers now recommend designing for mobile before desktop. Our experience with MACON has shown that if you consider the functionality of desktop and mobile interfaces together they can benefit from one another and users want a consistent experience. The EBSCO representative on the project board told us that they are also now designing for mobile first and then retro-fitting for desktop. The challenge for MACON was to address the difficulties involved in delivering quality academic content to mobile devices in a seamless and user-friendly manner through a resource discovery interface. The purpose of the project was to explore the possibilities and share the findings with the M-Libraries community. The content available to our users includes a wide selection of third party material & local collections such as the Open Research Repository (ORO) and OU audio-visual materials. Much of the quality academic content libraries make available to their students comes from electronic journals. The articles in these journals are most commonly provided as PDF documents, which are not ideal for reading on small screens. Often the PDFs do not allow their text to reflow which means that reading them on a mobile device can be akin to using a screen magnifier – you have a small window onto the text and you have to keep moving the text around under that window. As you can’t see the full layout of the document this can be very disorienting. When you reach the end of a paragraph it’s not always clear whether you should move down or sideways. There are tools available to force existing content to reflow for mobile screens, but many licence agreements with content providers (and some copyright statements) specifically prohibit the reformatting of the materials they supply, so libraries can’t use these tools on third party content. Materials in other formats can present similar difficulties as not all devices support all common media formats. For instance Apple don’t support Flash, which has been a popular format for learning objects and videos. This project reinforced that developing for mobile devices is complex because of the wide range of operating systems, browsers, screen resolution and processing power that are in common use at present. We also learnt that our users do want some advanced functionality on mobile discovery tools, such as the ability to toggle between only showing search results where the full text is available and showing all results. It is always worth doing user research. Open data isn’t always easy to use, even when it is coming from your own institution. We weren’t able to complete the inclusion of OU audio-visual materials in the search results because the metadata is only available to us as linked data and OU library staff currently lack the skills to work with it. Some licence agreements with content providers or publishers prohibit storing user log-in credentials on their personal devices. When recruiting users to give any kind of feedback you will get a far higher response rate if you can contact them directly than if you issue the invitation to participate through a website, online noticeboard or other “pull” media. The process of writing the good practice toolkit exposed me to different tools and methods which would have been useful during the project. The toolkit could have been of benefit to the project if it had been researched and written alongside the development and evaluation rather than after they were completed. The project has given us the opportunity to verify what our learners want from a single search box for mobiles and to improve the mobile search tool we offer. Working with the EBSCO API has provided our Systems Development team with valuable experience which can be carried forward to improve the search/discovery experience on our main website. As the mobile site is not yet heavily used we have been able to use it to test some experimental tools, such as listing recent search terms and recently read items for individual users. For our students the advantage of mobile access to materials is the flexibility it offers. If you unexpectedly have a little spare time your mobile can help you use it productively. If you can’t access the family computer because your children are doing their homework your smartphone provides an alternative. The Open University is the biggest university in the UK with more than 260,000 students. We are a distance learning university, so very few of our students ever visit the library building in person. Only our ~1200 full time research students are based on campus. Around 70 per cent of our students remain in work while studying, so their study time is tightly squeezed between work and family life. Up to 44% of our UK student population starts undergraduate study without the entry qualifications they would need at a conventional university, and others start study with us after a long break from formal education. For these reasons our library services are focused on off campus access to e-resources and support. The aim of this project was to increase the availability of quality academic content for mobile users in a way that fits with their requirements. As libraries cannot alter the format of third party content the project also aimed to produce a ‘good practice’ toolkit for content providers. OU Library Services has had a mobile website since 2007 and were already using EBSCO Discovery Service to provide a single search across most of our third party and local content. The local content does not include catalogue data because the majority of OU students don’t have access to our print stock. 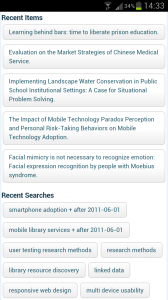 EBSCO agreed to work with us to improve the search tool incorporated in our mobile site. MACON increased the availability of quality academic content for mobile users. 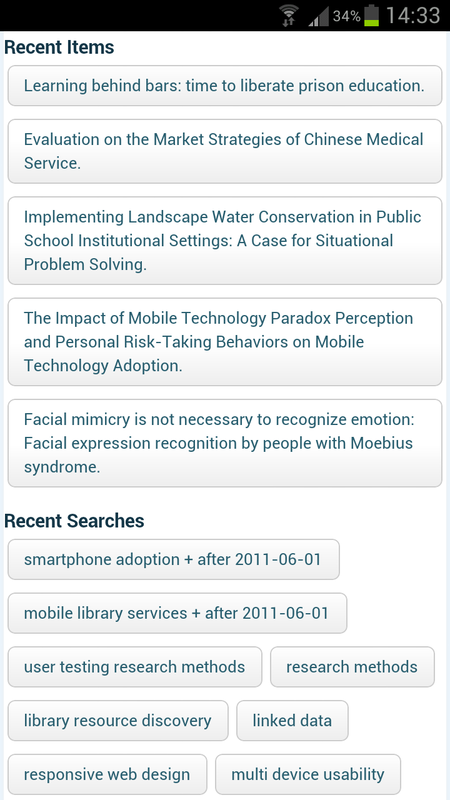 An interface was developed using the EBSCO Discovery Service (EDS) API to allow the search and display of search results within the OU library’s mobile website. This reduces the need for them to visit and learn to use multiple publisher interfaces. In addition users have access to a list of mobile-friendly databases. The project explored user requirements for the mobile delivery of academic content from both third party and local collections. We found that user requirements vary by user group (e.g. level 1 and 2 students, level 3 or higher students, researchers and librarians). While the project did add to the understanding of user requirements engagement from users in requirements gathering activities was low. MACON identified and documented the risks and barriers involved in making academic content accessible to mobile devices. With the help of the project board and internal stakeholders the project was able to identify technical, legal and policy-related risks and barriers. The project produced a ‘good practice’ toolkit for content providers, based on the experience of the project. It will be distributed to publishers as a document on a project branded USB memory stick through library staff contacts and through conferences publishers are known to attend. The project has been disseminated to library staff through 3 project spotlight presentations. The user requirements work was disseminated to the Computer-Aided Learning Research Group (CALRG) conference. The project outcomes will be presented at the 4th International M-Libraries conference in September 2012 and the Internet Librarian International conference in October 2012. The progress of the project has been shared regularly through the project blog. The project was not able to produce a mobile bookmarklet tool to significantly reduce the authentication barriers for mobile users. After investigation by the project team into different approaches to improving the mobile authentication experience it was found that it was not possible to develop a secure bookmarklet that did not compromise password security or contravene our licence agreements. See the post on Approaches to improving mobile authentication for more details. The project was not able to include open access Open University audio-visual collections in this system and identify and document the issues in accessing this type of content on mobile devices. Once the project team had identified how OU audio-visual collections could be included it became apparent that it would not be possible to meet this objective within the time frame of the project due to resource availability within EBSCO. This has been included in recommendations for future work. We have been able to develop a partial proof of concept in order to identify the issues in accessing this type of content on mobile devices. The project team did not succeed in recruiting a broadly representative sample of users for evaluation of the prototype system to ascertain the usability and quality of the user experience. See Lessons Learnt for more details. One of the aims of the MACON project was to develop a bookmarklet that would allow users to authenticate securely without having to enter their full Open University password every time they wanted to access a mobile e-resource. To make authentication easier we had hoped to allow mobile users to register a PIN against their normal username and password, but after investigating various methods of doing this and the associated risks we found that it couldn’t be done without either storing credentials on the mobile device, which would contravene our licence agreements, or storing credentials in a database which could leave users vulnerable to password theft. Part of the problem is that the Open University (OU) doesn’t support an authentication API as it is not considered sufficiently secure so the only way to log in is through the existing web interface. The project team also considered creating a secondary EZproxy® instance which would allow users to authenticate through a character field with a requirement to enter specific characters from a dynamically generated grid (in a similar manner to the OU’s VPN) plus a PIN. In future we hope that the university will provide an app which will allow users to sign in once to use all Open University mobile websites or apps in the same way that signing in to their student portal (or the intranet for staff) currently allows them to access all OU systems on a PC. The compromise we reached for the project is to provide a list of all the databases we subscribe to which have mobile web interfaces using EZproxy links. This means that when library users open a link they are prompted to authenticate through the OU’s login page before being redirected to the selected database site. As we use single sign on this prevents them being asked for Athens or Shibboleth credentials which they don’t know. The EZproxy links can be bookmarked so that users don’t have to go through the library website to reach their preferred database. 1. Prototype discovery tool for delivery of academic content to mobile devices. 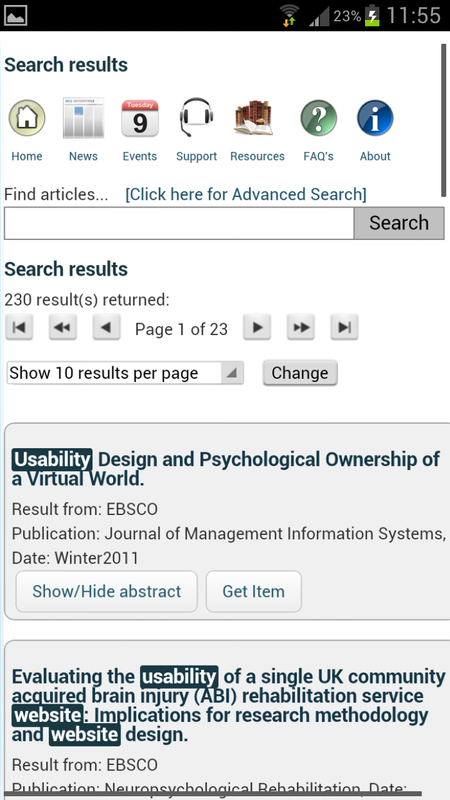 The discovery tool draws on the EBSCO API to return search results within the Open University Library’s mobile website. The user requirements and the technical approach for this prototype have been shared elsewhere on this blog. The project worked with EBSCO to develop and test the prototype system using a combination of open source software (Mobile Web from MIT) and the API from EBSCO Discovery Solution (EDS). The project team sought advice from EBSCO on the use of their API and received input through an EBSCO representative on the Project Board. The tool searches across most of our third party content as well as local collections such as Open Research Online. The search terms are highlighted within the results and users can read the abstract inline by tapping on the article title. Tapping “get item” takes you to the full text of the article. Following user feedback we plan to add check boxes to each result which will allow users to select results to save to a bibliographic management tool so that they can access them on other devices. At the bottom of the screen the individual user’s most recent search terms are listed so that they can easily repeat the search, along with a list of full text items they have accessed so that they can easily find them again. OU library users are now able to connect to third party databases which have mobile-friendly interfaces through the EZproxy system. The mobile website now includes a list of mobile-friendly databases with persistent EZproxy links. These links direct the user to authenticate through the OU SAMS authentication system and then connect them to the resource. The user can bookmark the URL and it will still work the same way. Other authentication options were explored, but the one above was the only one that complied with our licence agreements and the Open University’s security policies. A good practice toolkit for publishers and content providers delivering academic content to handheld devices has been developed as part of the project. Parts of the toolkit may also be of use to libraries. It includes good practice guidelines, basic principles and practical examples to help content providers who wish to optimise their content for delivery to mobile devices. Usability is an important consideration in any interface design, and can be particularly critical where screen space is limited and input options are fiddly to use. A usable interface will enable users to complete a task with minimum frustration and little effort. Particulary when using mobile devices users will expect convenience to be a top priority. In order to achieve a usable interface it’s important to consider the whole user experience, and to start considering user requirements early on. Usability testing should be carried out in several stages throughout a development, not just at the end. Testing your design through wireframes or paper prototypes will allow you to make adjustments early on, which is more cost effective than only identifying flaws at the end of the development process. There is some debate among usability testing experts whether it is better to test mobile interfaces in a controlled environment or in the field. Some argue that testing in the field gives a more realistic experience as the users’ concentration is likely affected by distractions in their environment. Others claim to have found that there is little difference in results whether testing takes place in the field or in a controlled environment. The advantage of bringing users into your own environment is that you can control sounds that might interfere with recording their comments during the test. There are a number of tools and techniques that can be used for usability testing, which are listed below in order of cost, from high to low. 2a Eye-tracking equipment with click and screen recording software The software will produce a ‘heatmap’ showing where participants’ gaze has lingered most on the interface, which shows which elements users are really seeing. 2b Tap/click and screen-recording software such as Morae This will show where participants tapped or clicked and how they navigated from page to page. 3 Undertake your own usability testing with the users in their own environment using tap/ click and screen-recording software such as Loop 11 or Usabilia These tools allow the user to undertake the testing in their normal environment in and interact with their device in a natural way, but don’t give you the opportunity to observe or interview them. They are useful if you’re not able to arrange to meet with participants in person or as part of ongoing iterative testing. If you do decide to undertake your own usability testing Steve Krug, author of “Don’t make me think” and “It’s not Rocket Surgery” provides some useful templates at http://www.sensible.com/downloads-dmmt.html. Test with participants’ own phones/devices so that they’re already familiar with how to use the handset. There are many different types of mobile device and the usability of the device will affect the test results. Make it clear to participants that it is the interface being tested, not them. Also explain that you want them to be honest and won’t take offence if they criticise the interface. When deciding how to record the test make sure the participant’s interaction with the device is as natural and unencumbered as possible. The second Macon Project Board meeting took place on 25th April 2012. Ron Burns, the project board member representing EBSCO Publishing, joined us via Lync Online Meeting software. 3.1 Users should be given the option to refine their search when clicking on a saved search. Search terms are inserted into the search box, so users can easily refine them if they wish. 3.2 Users should be allowed to delete recent searches or save favourites. Not yet implemented as it requires time from a developer not on the project. 4.1 Ensure participants in the diary study and future evaluations are widely representative of study levels and search confidence. Difficult to guarantee as survey samples are not available from the Student Statistics office at present. 4.2 Consider working with OU Annotate for social bookmarking of search results Not within the scope of the project, but will be pursued as a further development. Project developer started on 18 January and finished on 4 April. Budget on track to be spent by end of project. The search results interface has been improved to meet user requirements and usability conventions. E.g. search terms are now highlighted within results, users can choose the number of results to display per page. Security of bookmarklet discussed with OU Head of IT Security, in February 2012. After extensive exploration of different options the project team concluded that it will not be possible to provide students with simple mobile authentication within the scope of this project. The proposed method for providing a PIN will be documented as part of the project outputs. There is a proposal in another unit to create an OU app which will provide a single point of authentication for all OU mobile websites. A page listing ‘mobile resources’ has been created which provides libEZproxy links to mobile versions of databases, ensuring OU library users are directed via the OU authentication page rather than an Athens authentication page. The project team have had regular meetings with the OU Media Player project manager. The media player is still under development, but a demo version is available which can be used to develop a proof of concept. The final version will be available from July. The data we need to expose OU audio and video content from podcast.open.ac.uk is publically available from data.open.ac.uk, but only in a linked data format (RDF) which the EBSCO Discovery Service (EDS) does not currently ingest. EBSCO are looking into supporting it in the near future though dates are still unconfirmed. An alternative approach would be for the Library’s Systems Development team to convert the existing database (or RDF dataset) into Dublin Core or OAI-PMH format. However, the EDS team already have a queue of data ingestion requests to process so ours would take a few weeks to deal with, so this option isn’t viable in the timescale of the MACON project. The project team will explore the possibility of using a mySQL dump of podcast data and query it to integrate search results with EDS API as a short term solution. This approach will also help other users in the community to learn how to integrate results from a local collection with EDS index. The first draft of the toolkit is in progress. The project manager’s intention is to provide the toolkit in two parts – for managers and for developers. Further evaluation planned to take place during face to face campus events. Submitted abstracts to M-Libraries conference and Internet Librarian International. Progress and methodology will be posted on the project blog throughout the project. Continue work on including OU audio and video content in search results. Write up further work the library could do as a result of the project. Complete work on including OU audio and video content in search results. Complete second draft of Good Practice Toolkit. The mobile discovery interface is available on the live mobile library website at www.open.ac.uk/library/m. The project manager presented a draft outline for the Good Practice Toolkit for comment. Compliance with legislation. Paragraphs to point to compliances. It was also suggested that a mechanism could be set up to enable others to share their own tools. The project team aim to have completed the first draft of the toolkit by the end of May for circulation to stakeholders and the project board for comment. A second draft will be completed in June and the final version by the middle of July. The toolkit will be disseminated through the blog.